majority of the %, if not all of them, are an approximate based on the information they received from the iRO GMs. Drop rate information they receive is split into extremely rare, rare, uncommon, common etc. this i remember from last time I open the boxes. Byeollongum can also come from them apparently. or cannon spear or wtvr, I'm at work so I cannot put the screenshots obviously. Edited by Kiryu, 25 January 2013 - 01:56 PM. Ygnus Stale: Search for it on Ragial. There was a post about it too by the vendor asking for a price check. No clue whether he/she sold it yet. Edited by Kiryu, 25 January 2013 - 11:37 PM. Some provided weapons that have no database link will be added later. 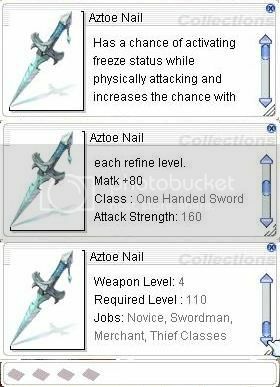 Will it be possible to just maybe ask the GMs for like 100+ of these boxes in sakray to see what drops? Got Dragon Slayer from it today. Keep opening them people and if you get a Guillotine Katar I'll buy it. Thanks to all of the informants, and hope you guys can keep helping me here! another version as in a slotted version? Maybe the slot is hidden like guillotine katar, try using a weapon card. Edited by beaupoem, 02 March 2013 - 12:18 AM.